Boat is located in Sayville,NY.Please contact the owner @ 631-650-5027..Bertram 33 offers timeless, classic lines combined with top quality construction and engineering. "Hooked Up" is a nice example of a classic Bertram 33. She is a hefty, high-end flybridge convertible with a tall profile and well suited for fishing, cruising. Surprisingly spacious salon with good headroom, full galley, and upper and lower helms. 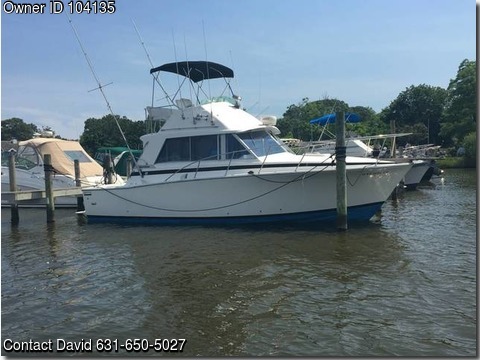 She has air-conditioning & heat, Head (Electric Flush) w/Vanity/Sink/Shower, outriggers, refrigerator, stove, and microwave, Onan Generator (not operational), two VHF, Windlass Anchor, radar, GPS, stereo. She was professionally yard maintained. The motors were replaced with new 383 c.i. inboard Mercruisers (standard and right rotation) and installed dripless shafts in 2013. Trim tabs rebuilt and aft bilge pump repaired and ran harness to bridge so start could be done up top and wired in two alarms to protect engines. The hull was glass blasted to the water line and barrier coated four coats of expoxy/Tuff Stuff in 2014. Then, applied hard bottom paint and ablative. Enclosure vinyls were replaced by Dor.A.Mar in 2012. Professionally yard maintained (receipts for all) New motors $21592.59 Labor for installation $4359.99 Hull $3026.19 Ablative bottom paint $526.28 Wiring/Trim tabs/bilge pump/alarms $1648.22 Enclosure $543.13 Enclosure $86.90 Fuel capacity 255 gal. Beam 12'6'' Water capacity 70 gal. Height above waterline 12'0'' Draft 3'3'' Serious inquiries/No brokers please.